This is a very easy to use Sound Detection Sensor module. 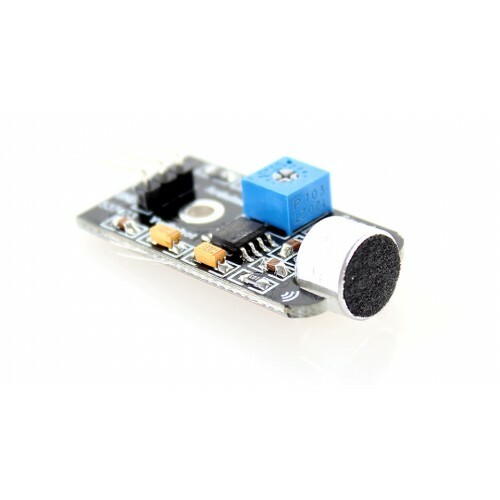 The Sound Sensor module has on-board Microphone for sound detection and it has a Digital Output where the output pin is High or Low and depends on the sound intensity and the set threshold. This threshold can be set via on-board potentiometer. This module can be easily be connected to Arduino, Raspberry Pi, and any other micro-controller as well. Lot of resources and tutorial for Sound Sensor module is easily available online. ISD1820 Voice Record ModuleVoice Record Module is base on ISD1820, which a multiple‐message record/p..
MAX4466 Electret Microphone Amplifier with Adjustable GainThis module is based on Maxims MAX4466 Mic..
KY038 High Sensitivity Sound Sensor Detection ModuleKY-038 Microphone Sound Sensor Module with analo..